Welcome to our first newsletter/ product update. 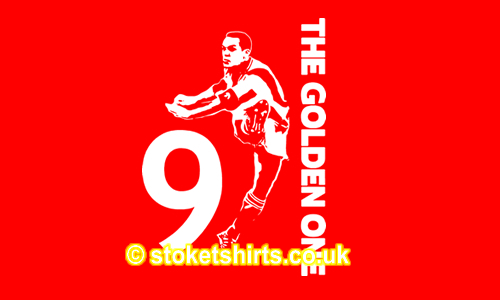 We have had a great first month and have Nine new designs to top up our heroes & legends and general Stoke categories. 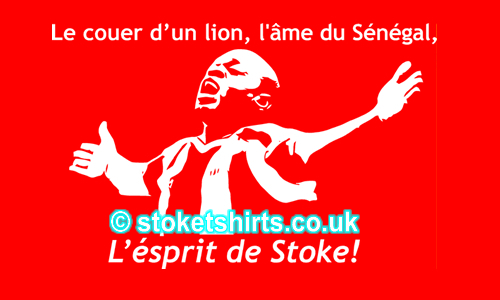 We also have a great Abdoulaye L’Esprit design that we hope you will like. The recent perfect weather has been ideal for T shirts so why not treat yourself to one of these great designs to wear on your holidays? Also don’t forget Father’s Day – one of our shirts would make a great gift. N.B. The quality of these images is deteriorated when reduced to fit this media. Please click the image to see the higher quality version. Our second tribute to Earl Mark Sean Stein (as his mother christened him).Our less original naming convention of the design describes the layout. a vertical line of text proclaiming STEINO! along with Mark in his red and white stripes. Looks fantastic on a black shirt. Again not the most inspiring name of a design but this simple duo-toned image captures all that is great about Steino!Simple, effective, and makes a striking impact. 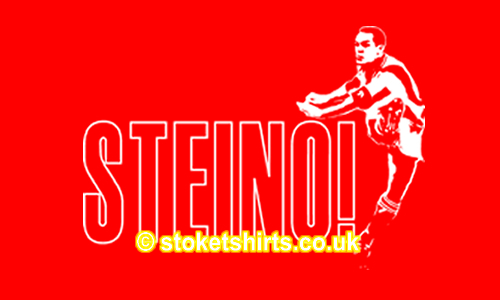 A goal ratio of better than 1 in every 2 games ensured that Steino made his Mark on all Stokies memories. Looks great on a red shirt. The subject of this design needs no introduction or fanfare, so we’ll keep it simple like the design – SMITH. Undoubtedly TP’s best signing from last season. This man has taken on the mantle of centre half cult heroes like Georgie Berry & Denis Smith before him. Again a difficult choice between designs so we have produced both! See below for a full translation. L’esprit in colour. 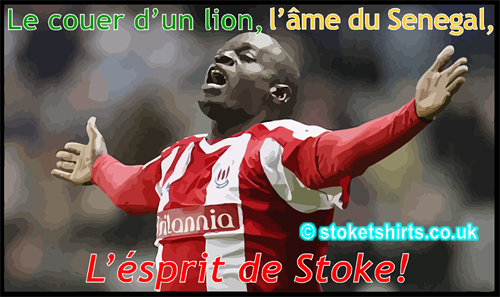 The text in Abdoulaye Faye’s native tongue says ” Le coeur d’un lion. captures all that Abdy is about. After launching Stoketshirts.co.uk we are going through the process of transferring our Classic Lifewear range to the new store. 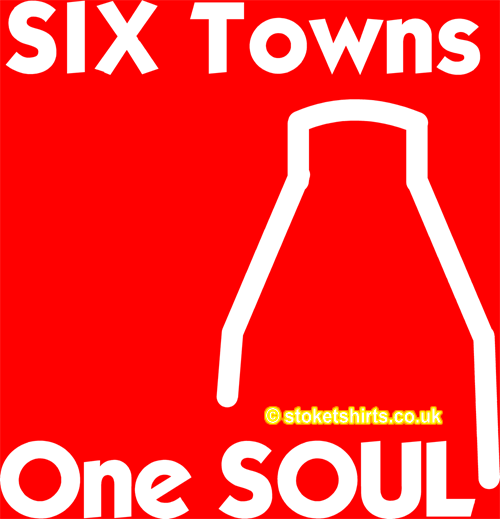 Featuring a Potters kiln and the text Six Towns – One Soul. A statement similar to “vis unita fortior” in the respect that while the six towns maintain their individuality, when put together collectively we have a very strong identity of creativity and a philosophy of work hard, play hard. 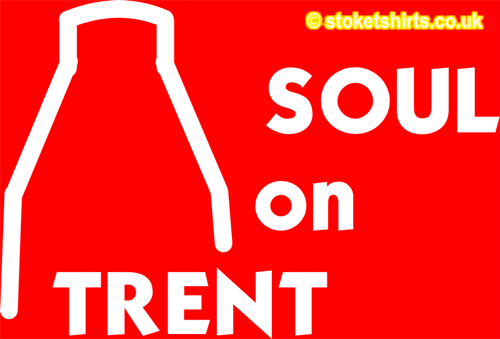 Soul on Trent – again features the Potters kiln and is a nod to the Northern Soul scene that Stoke – on – Trent was the hub of back in the late 60’s/ early 70’s. The essence of the Torch and Motown music drove the scene that has recently been revived with regular Northern Soul nights at lots of venues in the area. publicity oxygen has been given to the likes of Paddy Shower and Talk Shite, but don’t hold your breath; it won’t stop them from doing it again. Burnley next time? What next for us? I fancy a few high profile players joining the Mighty Potters to help us maintain our Premier League status and to become an established club at this level. Who would have thought that 2 years ago? STOKE. It’s been a great experience following Stoke this year. Let’s keep it up for 2009 -2010 and beyond! It’s FATHER’S DAY on Sunday June 21st. and it will creep up very quickly. 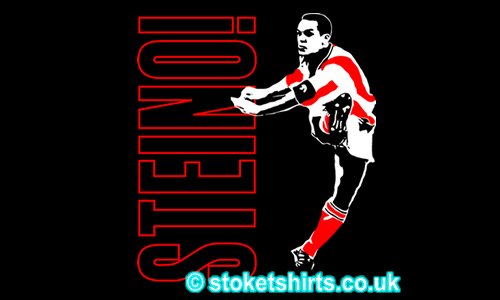 So avoid disappointing the “old man” and get him a Stoketshirts.co.uk T shirt, Hoodie or a Long sleeved shirt that he will cherish and wear with pride. If you are a Dad then it’s time to turn the tables on your family and use your “pester power” to get them to buy you one of our fantastic designs! Have a good one! A week in the life of football – Chelsea, Tony Pulis, Man city, QPR, Brisbane Roar and more!